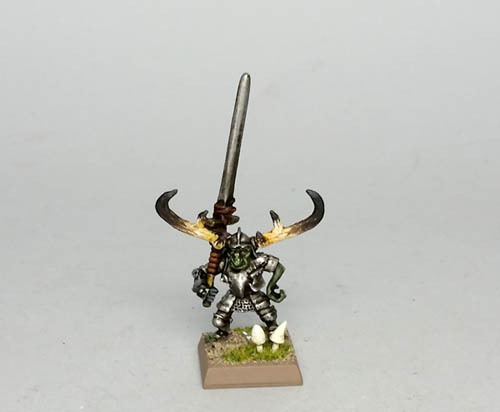 I placed a small order with Noble Knight Games for a few more of the Reaper Bones orcs, so I can convert some more Fomorians. After browsing the catalog I splurged on a few small items. Some more goblins for Zogmar's small but growing warband. The little guys in the top photo are "Chaos Goblins" from RAFM. Quirky figures, but I like them & wish there were more than this single pack. I like the idea of goblins being a heterogeneous species, so I see no problems mixing styles. Quick & dirty paint jobs. Literally. I used multiple black washes, hoping to get a dark & sinister look, and a somewhat oily appearance to the steel. I also wanted to get them done quickly because I'm going to try putting together a simple solo skirmish, and wanted to have them available as possible villains/raiders. The heroes, travelling mercenaries defending a small village, will be all of the various figures I've received from other people via the Warhammer-Empire.com "Pleasant Surprises" figure exchange. (Except one, King, who will be on the opposing side for obvious reasons.) I have named them after their source/painters.